The 4K Ricoh Theta is real! 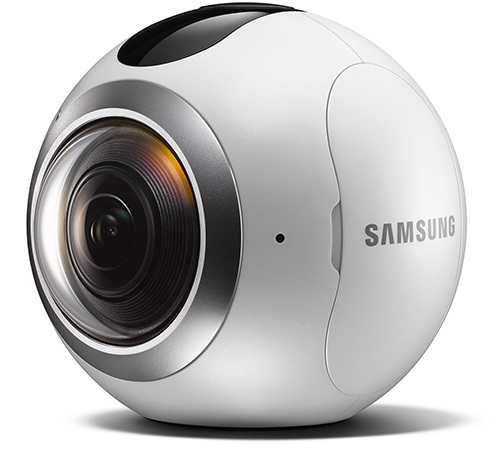 The Samsung Gear 360 is one of the hottest 360-degree cameras right now. However, it only connects to recent flagship Samsung phones (Galaxy S6 and above), and unlike traditional cameras, 360-degree cameras are highly dependent on smartphones for their controls. I use an iPhone and don’t plan to switch to Android but I ordered the Gear 360 anyway. No, I don’t expect Samsung to change its mind and allow the Gear 360 to connect to other smartphones. I get the impression that Samsung is trying to build a closed ecosystem, Apple style. If you take press the shutter on a 360-degree camera, your hands will be very close to the camera, which will make them look very large. The standard solution is to use a remote to trigger the shutter so the photographer can move away from the camera. The Gear 360 uses a smartphone as a remote (just like many other 360-degree cameras). But even without a smartphone, you can use the self timer. By activating the self-timer, you can trigger the shutter even while being away from the camera. In fact, with my Ricoh Theta S, I almost always use the self-timer instead of using my phone as a remote trigger. So, not being able to use a smartphone as a remote with the Gear 360 is not necessarily a dealbreaker for me. Without a smartphone, you cannot see a preview of the image that the Gear 360 will be capturing. However, I’ve been using the Theta since June 2015 and have since learned how to visualize what a 360-degree camera will capture. With practice, you can too (although I admit it’s much easier to learn when you have immediate feedback from live view). Without a smartphone, you can’t change the exposure of the Gear 360. This is a headache. Without exposure controls, I can’t bracket, and I’m at the mercy of the camera’s chosen exposure. However, most of the time, I rely on auto exposure on the Ricoh Theta S. It’s not because of laziness, but rather because I’ve found that the Theta does a reasonable job of finding a good compromise for a chosen exposure. As for the Gear 360, I haven’t used one yet, but the sample shots I’ve seen seem to indicate that it also has a reasonably good exposure algorithm. I’ve also used the Samsung NX500 extensively, which has the same DRIME Vs processor as the Gear 360, and I think I have a pretty good idea of what the exposure will be like. To transfer the Gear 360’s photos and videos to your phone, you need their smartphone. This is a major problem — as much of a problem as the inability to change exposure. On the Ricoh Theta S, I almost always handle all the processing on my phone. This is not just out of convenience, but because on my phone, there are several very useful apps for editing 360-degree images and videos, that don’t have equivalents for desktop. Nonetheless, it is possible to edit the images on my phone. I will need to download the photos from the Gear 360 to my desktop, upload them to the cloud (I use Google Photos) then download them to my camera for editing. Yes it’s very tedious, but it’s doable. This is the most important reason I’m getting the Gear 360. Currently, there seems to be nothing better for consumers that is close to this price. Yes the Ricoh Theta S is great but its video is meh. The LG360Cam looks good, is just $200, and works with all phones. But ultimately, it seems that the Gear 360 has better image quality. Even if I have to buy a separate smartphone, I think the price would still be justifiable. On eBay, I’ve seen several used S6 phones that can be bought for under $250 (with some damage). If I find that I absolutely need a phone, then I’m willing to get a used phone. A side benefit is that if I got an S6, I could get a Gear VR as well. But hopefully I don’t have to. So I bit the bullet and ordered a Gear 360. I will of course post a detailed review, with a detailed comparison against the Ricoh Theta S.
Is this what VR cameras of the future will look like?